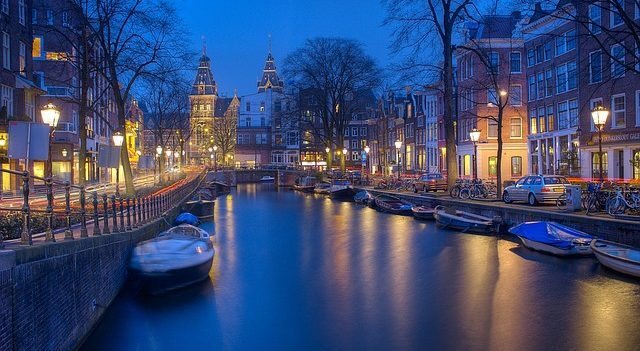 Save on Your Amsterdam Hotels with Holiday Inn Coupon Codes. One of the best ways to see Amsterdam is by walking, as much of the city is relatively flat and compact by European standards, and most of the main sights are in the historic center. Much of the historic center still consists of lovely old gabled houses alongside picturesque canals. At first glance, most of the homes look the same but watch for unusual decorative features, designs, and murals. Many of the taller houses still use a rope and pulley system to get furniture in and out of the homes, as the staircases are too narrow. Over half a million visitors and residents also travel by bicycle, and cycling in the city is relatively inexpensive and safe. Another way to get around and to get a different perspective is to take one of the many canal cruises that are available. While on board, look out for some of the more than 2,000 houseboats throughout the city, many of which are uniquely decorated by their owners. Nightlife in Amsterdam is legendary. Apart from the red-light district, which occupies a large center of town near the central railway station, there are other nightlife areas. Leidseplein is the Dutch answer to Times Square with restaurants, movie theaters and plenty of bright neon lights. Amsterdam is one of the few cities in Europe that show recent films from the United States in English. The famous Concertgebouw, initially built on wooden stilts, is still one of the most acoustically perfect concert halls in the world. For dining out in the city, try one of the numerous Indonesian restaurants, a legacy of the time when the Netherlands’ colonies stretched all the way to the Far East. There are many bars and cafes in Amsterdam where it is acceptable, if not strictly legal, to smoke marijuana; these establishments are sometimes recognizable by a green leaf painted on their window. For a uniquely Dutch experience, go for a drink in one of the “brown cafes,” so-called because of the dark brown stain on the walls, the result of years of tobacco smoke. They can be found all over the city, but especially in the working-class Joordan neighborhood. Amsterdam’s museums range from the tiny but fascinating Tattoo Museum to the Rijksmuseum, which is one of the most excellent institutions in the world. The Rijksmuseum has over 200 rooms and contains the most extensive collection of paintings by the Dutch masters, including the well-known Rembrandt work, The Night Watch. Another museum which is extremely popular is the Anne Frank house. This house is where a young Dutch girl hid from the Nazis in occupied Holland for several years until finally the hideout was discovered by the occupying forces. The attic where Anne hid and wrote her famous diary is as it was 50 years ago, and although there is little to see here, it’s a moving experience. The third must-see museum in the city is the Vincent van Gogh Museum. Nearly every painting Van Gogh produced, along with his sketches and letters, are on permanent display here, along with temporary exhibitions. Amsterdam is also famous for its diamonds. An important center of diamond cutting since the 15th century, it is still one of the biggest diamond markets in the world today. Many showrooms in the city offer guided tours and demonstrations of cutting diamonds, and of course, someone will pressure you into buying something, but there is no obligation. One of the best places to go just to watch the process is the Amsterdam Diamond Center, in the center of the city. If diamonds are not in your budget, Amsterdam has some of the best street markets in Europe with over 50 markets in and around the town every week, although the biggest and best is the sprawling flea market at Waterlooplein. Outside the souvenir shops, you won’t see many of those symbols of Dutch culture in Amsterdam: windmills, and tulips. If you feel a visit to Holland is not complete without them, two easy day trips from Amsterdam by train or bus will take you to the wonderful tulip gardens at Keukenhof, and the spectacular collection of working windmills at Kinderdijk.